Best-selling author Dr. Myles Munroe offers daily practical and biblical advice for women. 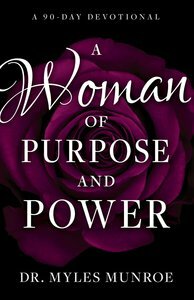 Based on two of his most popular books, Understanding the Purpose and Power of Women and Understanding the Purpose and Power of Men, this 90-day devotional will help you truly understand your God-given purpose and power as a woman. Each day's reading includes teaching and encouragement, a Scripture reading from both the Old and New Testaments, and a thought for the day to draw you closer to God and His purposes for you. Explore the nature and role of women as God intended, addressing such issues as: How is a woman uniquely different from a man? What are the purpose and design of the woman? What are a woman's emotional and sexual needs? What is a woman's role as a leader? What does the Bible really teach about women? As Dr. Munroe writes, "A woman cannot fulfill her purpose unless she is in relationship with God." Through this devotional, you can deepen your relationship with your heavenly Father and fulfill your potential as an integral part of His eternal purposes. About "A Woman of Purpose and Power"